KAMPALA – The legal fraternity is mourning the death of Henry Oluka, the Senior Principal State Attorney in the office of the Attorney General, who suffered cardiac arrest on Friday. 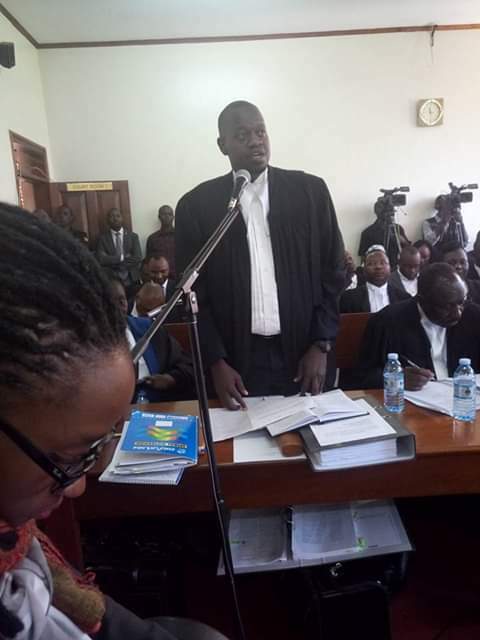 Oluka was part of a team of lawyers representing government in the case opposing the removal of the age limit from the 1995 Constitution. Oluka is said to have collapsed and died during a presentation at Golf Course View Hotel in Entebbe in a retreat of Ministry of Justice and Constitution affairs. He was said to be set to travel abroad for a heart surgery and was waiting for his heart condition to first stabilise before he could travel. Prior to joining the Attorney Generals Chambers, Oluka worked with Omunyokol and Co. Advocates now (G and P Advocates). He is a brother to Justice Michael Elubu. A close friend Petronella Ochom eulogized Oluka. “Your rich laughter, your great jokes and the dancing you would get to fill my mind. Memories I will not forget, memories I will always cherish. You were so full of life – now you like still. My tears flow endlessly even if I know you are with God. The human being in me maybe devastated but my spirit is calm because the angels are enjoying your company. 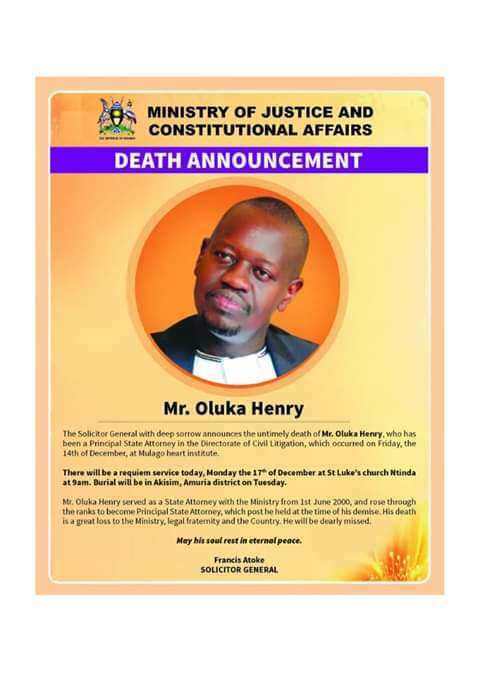 On Tuesday, 18th December, burial will be in Amuria Town Council, Amuria District, starting at 12:00pm.